A larger tablet from Samsung with a 10.5-inch screen and running on the Android 8.1 operating system at time of test. The Google Play Store and Galaxy Apps is included for downloading additional apps. Tested with 64GB of storage. 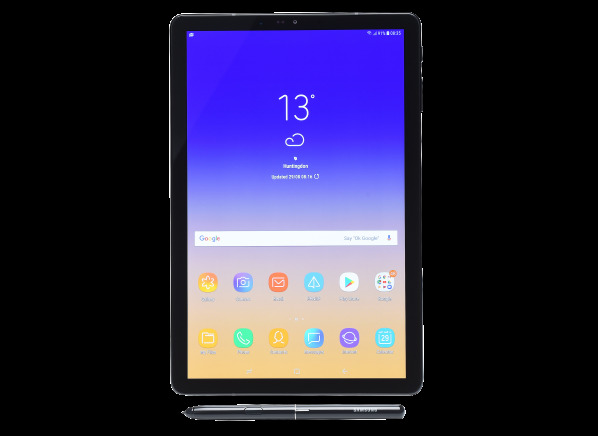 The Samsung Galaxy Tab S4 (SM-T830), (64GB) is a larger tablet with a 10.5-inch screen. It has a display resolution of 2560 x 1600, and produces very fine detail at 286 pixels per inch. The rectangular screen is a better shape for videos than for photos. The tablet has a 2.35 & 1.90GHz Qualcomm Octa-core processor and ran on the Android 8.1 operating system at time of testing. It has 4GB memory and is available with 64GB storage. You can add a micro-SD memory card for more storage. You can connect to the internet using 802.11ac WiFi. It has Bluetooth and you can mount a flash drive using the USB type-C port. It has an 8-megapixel webcam and a 12.8-megapixel camera with a flash. It includes a stylus. The Samsung Galaxy Tab S4 (SM-T830), (64GB) measures 9.8 inches long by 6.5 inches wide by 0.2 inches thick. Without a keyboard, it weighs 1.1 lbs.